Key West Watersports at its best with Key West Water Tours! Want to see more of Key West than just Duval Street? The Ultimate Island Tour is an exciting (and educational) 26 mile tour around Key West and neighboring islands. Two hours of fun on the water. 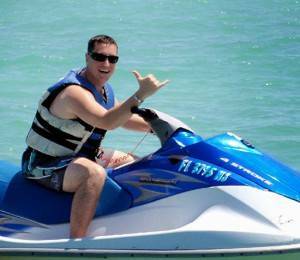 This Key West Jetski Tour has something for everyone. Along the way our guides will be stopping at several spots such as the Southernmost Point, the historic Key West Harbor, and the submarine pits and will give a little history of Key West. For the nature lovers our knowledgeable guides will be taking you through a mangrove creek and the shallow water ecosystem of the Gulf of Mexico and the Atlantic Ocean. You'll also have the opportunity to see native wildlife along the way such as jellyfish, urchins, stingrays, turtles, herons, egrets, and the occasional dolphin and manatee! For the adrenaline junkies there will be plenty of play time in both the Gulf of Mexico and the Atlantic Ocean! Plus you get a FREE BEER when you're done with the tour (over 21 years of age, of course!). 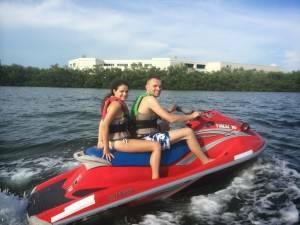 WANT TO BOOK A JETSKI TOUR NOW?